NEW YORK (WABC) -- Subway riders across the world saw a lot more of their fellow commuters Sunday. It was the annual No Pants Subway Ride, where straphangers shed their trousers and finish the trip in their undergarments. The tradition was started 15 years ago by an improv group in New York City and has spread to public transit lines from San Francisco to Jerusalem. Organizers call it "an international celebration of silliness." Going without trousers in Boston this weekend might be a tad less uncomfortable: Temperatures are forecast to hit a record of 60. 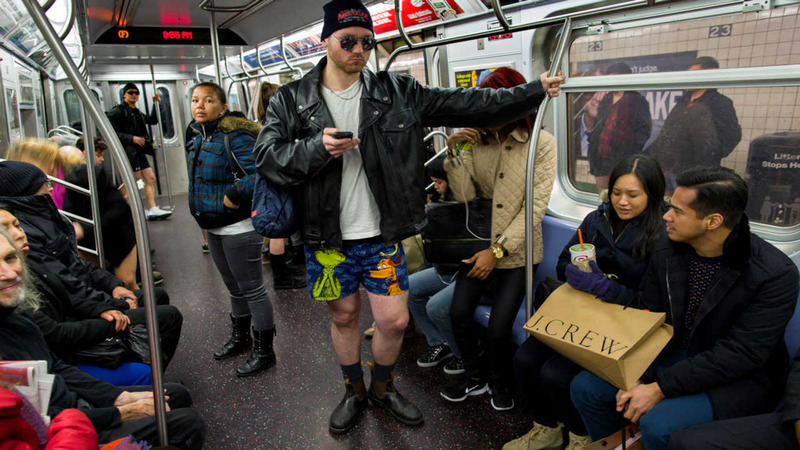 The pantless rode on subways in Atlanta, Chicago, Dallas, New York, London and elsewhere on Sunday.